Which? 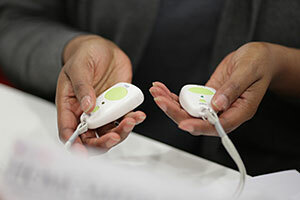 experts have selected and reviewed a range of assistive technology products that could help people with dementia, memory loss and other disability such as Parkinsons Disease stay safe at home for longer. And – as councils are increasingly cash-strapped – there’s a growing private market for devices you can buy. Have you thought about GPS tracking devices that could enable someone with dementia to go out with less fear of getting lost, a device that intercepts cold-callers, or a telecare alarm with sensors so your relative gets immediate help if things – from fire to flood – go wrong? Find out which memory aids our experts recommend, which telecare and GPS tracking devices you should consider, and which gadgets for staying safe at home are worth considering. If you are striving to care for a relative or to stay independent yourself, you may be considering options such as a care home or paid-for home care. Assistive technology and telecare cannot necessarily replace these, but they can play an important role in helping people stay independent for longer. If you’re a relative, they can involve you too – even if you live hundreds of miles away. You can monitor if your relative who lives alone is up and about as you’d expect (using sensors to relay information to your computer or smartphone), locate a relative with dementia who gets lost, using a safe-walking device, or have unknown telephone callers diverted using your own computer or phone. Telecare systems monitor vulnerable people and can send alerts when help is needed. At its most basic, telecare enables a person to call for help by pressing an alarm button on a watch or necklace pendant. More intelligent pendants can also sense a fall. Both alert a call centre to organise help. Other sensors around a home can flag risks, such as someone not returning to bed within a preset time, a flood, carbon monoxide or someone opening the front door. Telecare and other assistive technology can be a godsend when people can’t monitor or respond to risks themselves, but it’s important that the person is properly assessed to ensure they get the right system for their needs. No one product suits everybody, so professional assessment of your needs can be important. Even seemingly simple products, sometimes need a bit of extra thought. For example, a stove alarm would not be a safe option if it tells your mum that she’s left a saucepan on the hob, if she doesn’t understand the beeping or is unable to act on it because of her Alzheimer’s. For gadgets and telecare alarms that are linked to a call centre and for people with more complex needs, ask your local council for a telecare assessment. This is usually done by a specialist such as an occupational therapist. Your home is your castle, and you have clear rights when it comes to intercepting invaders. Uninvited or coldcallers who ignore a sticker or notice stating that you don’t wish to receive them may be committing a criminal offence, as is a trader who ignores your requests to leave and not return. Trading Standards recommends always saying no to anyone cold-calling, no matter how plausible, as it’s an approach favoured by rogue traders. For front door security, gadgets range from the sophisticated – a digital door viewer that takes photos of callers – to a simple door chain that can be unlocked from the outside (good if you care for a relative who keeps a chain on the door). Make sure your house looks occupied, even when you’re away, and that it’s not obvious a vulnerable person lives there. For example, a messy garden can tempt a prowling rogue trader to knock.